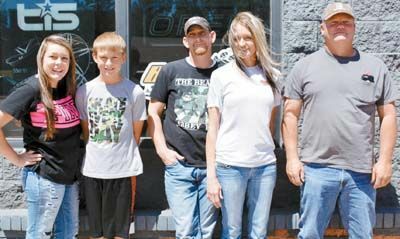 NEW OWNERS…Brad Bottom hands over the keys to Bear Trax Tire N Lube to new owner Nikki Gourley. The business located in Cheyenne is open Monday-Friday 8-5 and Saturday 8-Noon. Nikki has served as secretary for the past 3 years and is excited about taking over, “I would like to thank Brad for not only teaching how to run a successful business but also many life lessons.